Each character you control gets +1 STR. Reaction: After a challenge is initiated, kneel Winterfell. Then, each player with a non-Winter plot card revealed cannot trigger card abilities until the end of the challenge. Wolves of the North #17. 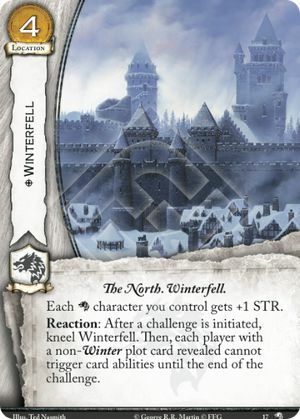 Winterfell prevents opponents from triggering card abilities, but it does not prevent occurrences mandated by the game, like "Forced Reactions", "Forced Interrupts", and "When Revealed". Likewise, as it only affects card abilities, it does not affect duplicates, which are defined as a triggered game ability. Finally, it only prevents triggered abilities, so it does not prevent anything that lacks a boldface precursor (e.g. keywords like Ambush or Renown, and constant abilities). However, it does stop pretty much everything else, including events. Since the limitation Winterfell places is on the player, not the cards themselves, it's not "restricted" to only affecting cards in play. When a challenge is initiated, several things happen simultaneously: characters are declared and knelt, stealth is declared, etc. The first player has the first opportunity to trigger a Reaction to any of these changes in game state. For example, first player could trigger Ser Horas Redwyne, who knelt to attack, Then second player could trigger Winterfell. Next, first player might want to trigger Ghost, who declared stealth, but he doesn't have a Winter plot, so Winterfell now prevents him from doing triggering any further abilities. An interrupt (like Treachery) resolves before its triggering condition does (That's why a card like Viserys [Core] can trigger - because his interrupt happens before he's actually killed). For example, when Winterfell is triggered but before it resolves, it is interrupted by Treachery. Treachery cancels it, so it never resolves. Also, because kneeling Winterfell is not part of the cost to trigger it, Winterfell does not kneel when cancelled.